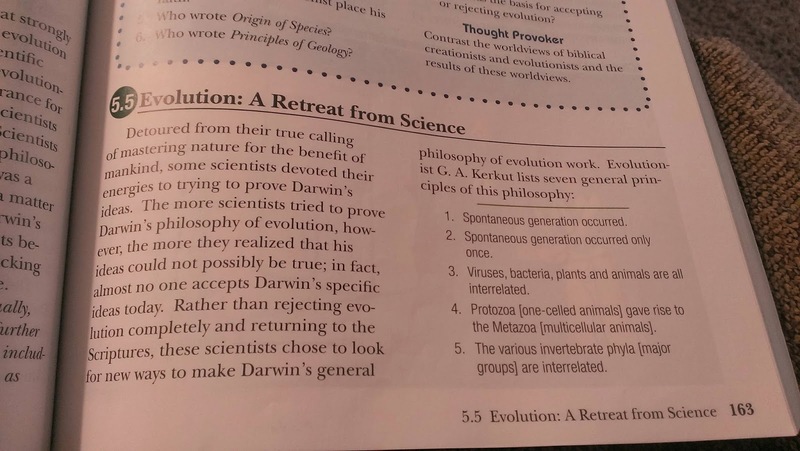 A textbook in a private Christian school is spreading lies about the theory of evolution and the people who believe in it. Someone with the username Dozer11 on Reddit posted on the social site a photo he took from a page of said book. In what looks like a chapter with the title Evolution: A Retreat From Science, the page claims that "the more scientists tried to prove Darwin's philosophy of evolution, the more they realized that his ideas could not possibly be true". It also adds that "almost no one accepts Darwin's specific ideas". These are of course blatant lies. The page also featured the late G.A. Kerkut's seven evolutionary assumptions which Kerkut felt lacked sufficient evidentiary support. These assumptions have since been taken and interpreted by creationists as supportive of their creationist views instead. Another Reddit user commented that the textbook may have been a book titled Science: Earth and Space by A Beka Book, a foundation with the "mission of providing Christian schools with high-quality textbooks and teaching aids to help each school fulfill its educational goals". The description for the book goes: "Students in grade 8 will investigate geology, oceanography, meteorology, astronomy, and environmental science with the goal of discovering the thoughts of the Creator through the ingenious structure and orderly function of His creation. Science: Earth and Space is written from the Christian perspective that God is the Creator and Sustainer of the universe. From geology to astronomy, the goal is to learn how man might make better use of creation. Textbook includes 27 hands-on activities. Designed to be used in grade 8 and is 440 pages." If you can't see the photo above, here's what it says: "Detoured from their true calling of mastering nature for the benefit of mankind, some scientists devoted their energies to trying to prove Darwin's ideas. The more scientists tried to prove Darwin's philosophy of evolution, however, the more they realized that his ideas could not possibly be true; in fact, almost no one accepts Darwin's specific ideas today. Rather than rejecting evolution completely and returning to the Scriptures, these scientists chose to look for new ways to make Darwin's general philosophy of evolution work. Evolutionist G.A. Kerkut lists seven general principles of this philosophy: [click here for a list of said principles]"